How to implement more complex navigation behaviour. Both ways are not optimal in most cases. The first one is very restrictive whereas the second one shows too much if your navigation tree is getting a bit bigger. ParentGroupID is the ID of the root navigation node for your navigation group. The purpose of the Build-method is to filter the navigation tree and return back the nodes which should be rendered for the user in the correct order. Of course every NavigationBuilder needs to know the navigation context, that is why AxNavigationContext is passed to it as a parameter in constructor. To implement your own NavigationBuilder inherit from NavigationBuilderBase and override the Build-method. It means, if you instantiate NavigationBuilderBase directly, you get nothing back. But you can leave Build() intact and override IsRelevant with your decision rule. BasicNavigationBuilder overrides IsRelevant as described above. It always returns the first level navgiation as well as all the nodes whoes parents are in the active path. It means, if you click somehwere, the tree expands one level where you clicked and collapses elsewhere. FirstLevelNavigationBuilder implements the behaviour we started with - show only the first level navigation (it also does not show the nodes which have no assigened elements). 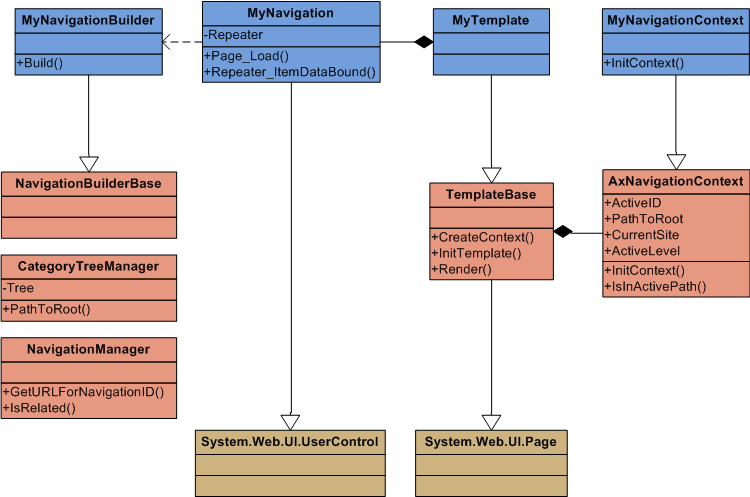 Why should you use NavigationBuilder pattern? Well, it is up to you if you use it. If your logic for filtering the navigation tree is simple, you can take one of the predefined NavigationBuilders or implement the filtering directly into the navigation control. If the logic gets more complex, it is neater to encapsulate this logic in its own class with a clear Build()-interface. It is especially useful if you have multiple navigation controls sharing the same algorithm or if you share the same algorithm between multiple projects. In the later case you can extract the custom NavigationBuilder into another DLL and reference in all the projects which need it. If you have multiple templates in your project, you could create a common base class for all them and move the manipulations with the NavigationContext there.